Lou Kloufetos adds on September 2, 2008: "WXVW and WAVG AM were once owned by Sunnyside Communications, of which Charlie Jenkins was an owner. He was also Director of Sales and was a play-by-play announcer for Southern Indiana high school football and basketball. Both stations were located at 230 Magnolia Avenue in Jeffersonville. (The building is now vacant.) In the early 1970s the station carried the games of the Louisville Colonels baseball team. The home games were carried live while the road games were recreated using wire reports. I used to listen to Charlie Jenkins do the broadcasts, between the ages of 13 and 14. I was really fascinated by the concept. "WXVW over the years played adult contemporary music and then in the '80s switched to the 'Music of Your Life' format from Al Ham productions. In the '90s the station became all sports and then after 2000 switched to country after WAVG took over the frequency at 1450. It stayed that way until Cumulus Media bought the station last year. When WXVW played 'Music of Your Life' the tapes were on 10-inch reels and fired from the board. That's when the announcers were live. Then it switched to the 'Stardust' format which was automated. The only time the station was live save for sports was morning drive time." Gerry Cunningham writes on December 20, 2008: "Just looking at your WXVW page; I did mornings and was the PD there from late 71-through 72 and flipped it Oldies (a novel format at that time); for the 1st time in the station's history the station showed a measurable audience in the ARB. As I recall we were 3rd Women 18-34. By the way the vintage Western Electric console allegedly came from WKLO-TV, which I think was the 1st UHF TV station in Big Lou (short lived since no one back then had UHF on their TV! Also, the old building on Magnolia was said to be haunted....can't prove it of course, but one night I was filling in for the overnight jock and while reading the news the studio door flung itself open; that had never happened before and was quite a shocker since I was the only (living) person in the building!" 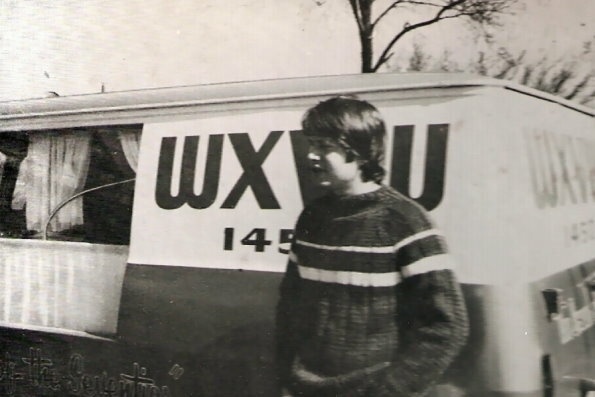 I went to work at WXVW in early 1977. I was 22 years old at the time, and desperate to break into the Louisville metro radio market. I started the midnight-to-6 am shift, babysitting the Herb Jepko "Nitecap" show until 5:30 am...at which time I could play a few records before my shift ended. I worked Sunday thru Thursday nights in the midnight-to-6 am slot, off Friday nights, and then did Saturday nights from 6 to midnight. Our weekday lineup when I started at WXVW was Jerry Hammett, air name Jay Allen, in the morning drive slot. J. Michael "Mike" Densford handled middays; Ted Schmuckie had afternoon drive, and Shelby Gene Wilkinson did the 6 pm to midnight shift. Our news director was Jerry Fordyce, and our Sales Manager was Gil "Doc" Daugherty. Charlie Jenkins was general manager, and Louisville radio legend Clarence Henson was the station's primary owner. Ted Throckmorton pitched in and did sports broadcasts with Charlie, as did "Doc." We also had some weekenders, such as Rebecca Dawkins/"Becky King," but sadly to say, I just can't remember many more names these days. The night that went over worst, as far as high school sports was concerned, was when Charlie and "Doc" sold the championship games from THREE high-school basketball sectionals to run on one Saturday night. 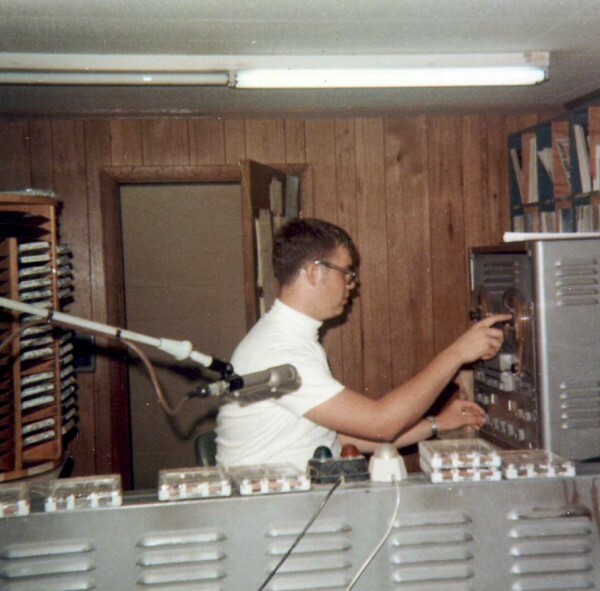 I was running the Jeffersonville sectional live in the control room; I was recording the Floyd Central sectional on the reel-to-reel in the control room; and I had the Madison sectional patched to the reel-to-reel machine in the production room. We were still airing high school basketball at 4 am...and some sponsors weren't pleased with the times their spots were running. But you couldn't say that WXVW didn't cover the local teams! 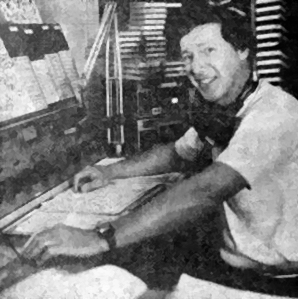 Since Clarence Henson also owned WLRS in Louisville and WORX in Madison, he worked out a deal by which WLRS jock Lee Masters, longtime Louisville air personality [and one-time roommate of Coyote Calhoun], would come over on Tuesday afternoons as a "programming consultant". 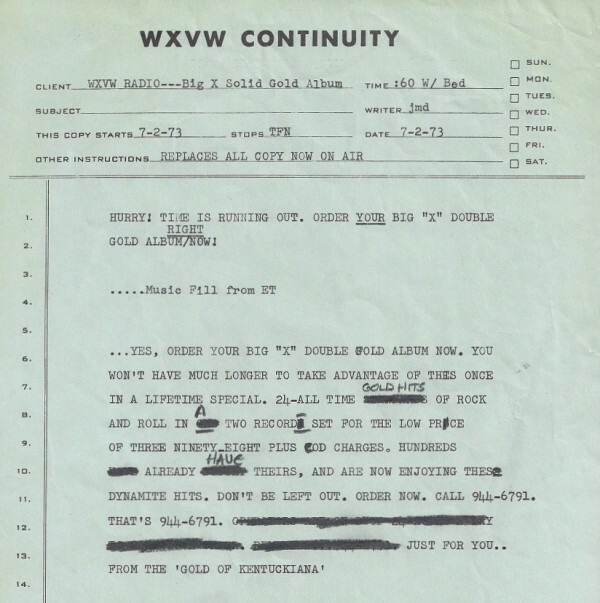 Besides playing oldies, WXVW also included songs from Billboard's Top 40 in their rotation [although I think we only had 25 "currents" at any one time]. Lee would advise Program Director Mike Densford on which songs he thought fit best with our oldies format, then Lee would meet with the jocks and critique our aircheck tapes. The station's location on Magnolia Avenue in Jeffersonville -- at the end of a dead-end part of Magnolia -- meant that there was only one pizza joint in the area who would deliver to the station late at night. It helps that they were a client of the station, and they made a really great hot sub. Michael Daniels Pizza, I salute you -- you were a lifesaver some nights! In the summer of ‘77, our lineup underwent some upheaval. Mike Densford quit radio to buy an auto body shop in New Albany, IN, and Shelby Wilkinson, who lived in Madison, quit WXVW to go to work full time at WORX in Madison. Dave Sakel was initially hired to do midnight-to-6 am while I moved up to work 6 pm-to-midnight. 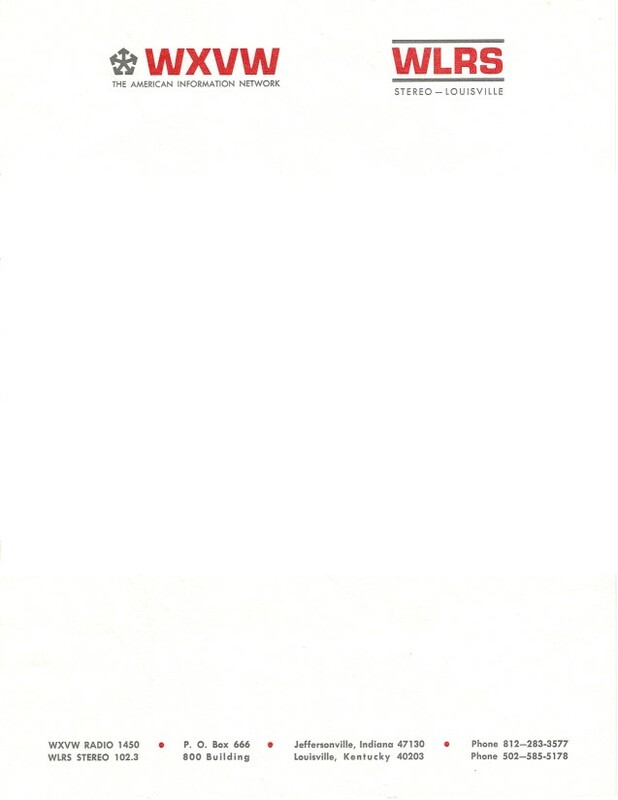 But when the second opening occurred, Ted Schmuckie and I spent alternating weeks doing middays and afternoons. I was confused, and I figured longtime listeners were confused not knowing "who's on first" from one week to the next, so in October of '77 I left, returning to WMMG-FM at Brandenburg, KY. In the meantime, I'd also picked up a gig taking transmitter readings at WAKY 790 for Ed Phillips, so I still had a foot in the door in the Louisville metro radio market. Thanks for once again allowing me a walk down Memory Lane. Those were some great times in a great business, and with conglomerates like Clear Channel in the mix today, those days of small owner groups are clearly a part of history. The Saturday afternoon that Clarence Henson talked me into going with him out to his farm, and viewing his collection of radio memorabilia -- such as one of the huge transmitter tubes used when WHAS first went on the air 50 years previously -- was one I'll never forget. I hope there's some information you can use here, John. The story of WXVW needs to be fleshed out further, but I don't know who from that era might add anything. Mike Densford passed away a few years ago, as did Jay Allen. I've looked for Ted Schmuckie and Shelby Wilkinson on the internet, but I haven't been able to find them. Know anything more about this station? Have any WXVW airchecks, photos or promotional material? 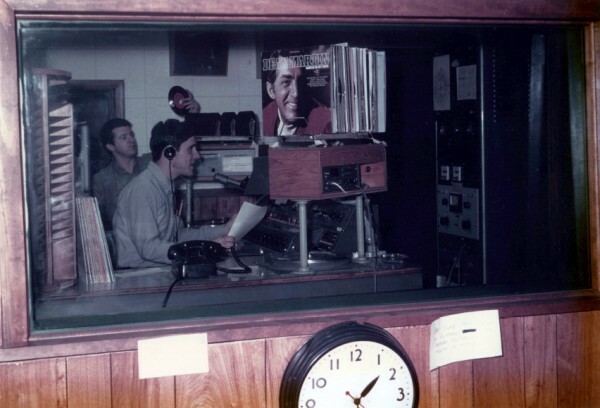 Here are the WXVW studios, circa 1968. Don Fugate is on the air, and Dan Steffen is behind him. 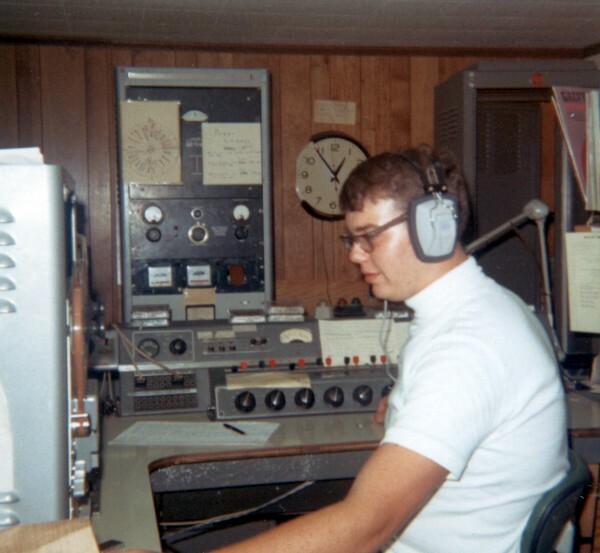 Don Hoke at the WXVW controls. The equipment included a 1930s-vintage Western Electric console, a Magnacord reel-to-reel deck, Sparta-Matic cart machines, Gates turntables and an EV-666 studio mic. Don Hoke cues up a tape in the WXVW control room. "Chilton is the newest newcomer to the early morning radio business in Louisville, although he's been with WXVW for the last 18 months. His radio career actually got started when was in the service singing and announcing for the U.S. Army Chorus. 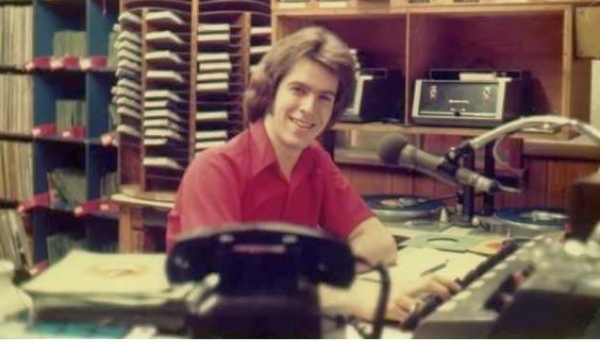 When he got discharged he though he'd try using his voice to make a living and landed his first radio job at WHIR in his hometown (Danville, KY). 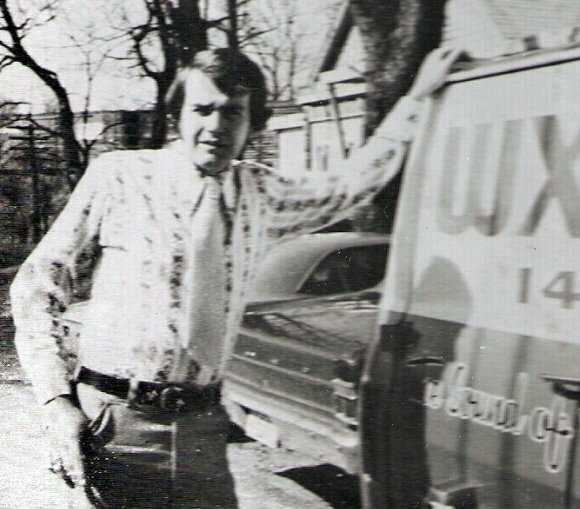 Three years later he moved up to Lexington, where he worked for WVLK and WLAP through 1969 while getting a degree in communications from the University of Kentucky. "By then Chilton was having second thoughts about the radio business. He moved to Louisville and earned a master's degree in community development at the University of Louisville. Then it was back to Danville, where worked for city government for four years. But he missed radio, so he returned to Louisville and he was heard over the old WCSN-FM. In 1977 he became manager of WUOL. "But by 1977 new doubts about radio cropped up, so he and his brother went into the Long John Silver franchise business to "make some money." He did, but he didn't like it and he missed radio. In 1980 he went to work for WINN. Then 18 months ago he moved to WXVW where he enjoys getting up in the morning.